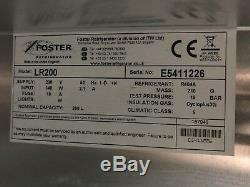 Foster LR200 Space Saver Undercounter Freezer. Collection Welcome, our showroom is located on the A264 just off the Dukes Head roundabout in the Silverwood Industrial Estate. (please call before visiting as we are sometimes out delivering). H824 x W684 x D750mm. Undercounter refrigeration ensures optimum use of space in tight kitchen areas, and none more so than Foster's high performance, low cost range of undercounter cabinets. The LR200 comes with forced air circulation for even cooling and high performance in busy kitchens & front breathing refrigeration system facilitates siting in enclosed areas. Temperature range -18 to -21C - Maximum ambient temperature 43C. 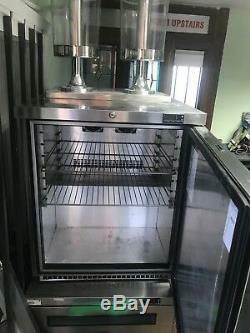 Forced air cooling - Microprocessor control with digital display - Front breathing refrigeration system. Integrated door lock for security - High quality magnetic door gasket - 2 Adjustable nylon shelves. Forced air refrigeration for efficient operation - Automatic defrost for hassle-free operation - Electronic temperature display. Roller castors to rear, leveling bolts to front - External stainless steel , Internal aluminium - Refrigerant charge 0.16. Thermal heat rejection (W) 426 - Refrigerant R404a - Weight unpacked 84kg - Electric 230V, 13A,, UK Plug. 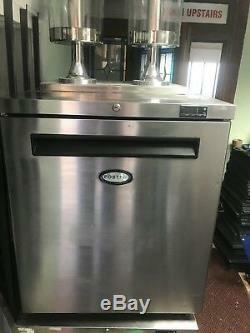 The item "Foster LR200 Space Saver Undercounter Freezer" is in sale since Monday, July 16, 2018.